Pearl Jam guitarist Mike McCready will be honored with the Stevie Ray Vaughan Award at the 2018 MusiCares Concert For Recovery at The Showbox in Seattle, WA on Thursday, May 10. The music industry charity is recognizing the rocker for his significant dedication to, and support of, MusiCares and his commitment to helping others in the addiction recovery process. 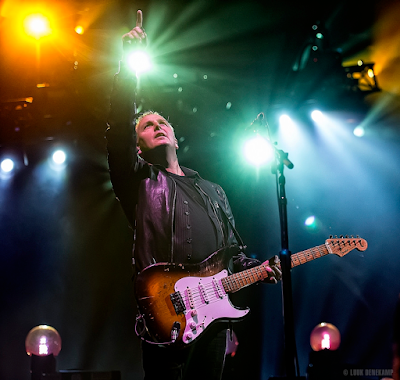 "Recovery is a journey that you take each day, and mine has been affirming from a musical standpoint and a community perspective," says McCready. "To be able to raise funds for MusiCares and the critical addiction recovery work they do for music people across the country all year long is humbling, and it speaks to the way we can come together to help those in need." The Concert For Recovery will feature performances by Slash, Duff McKagan, Nancy Wilson of Heart, Red Hot Chili Peppers drummer Chad Smith, Mike Ness and Barrett Martin, while the evening will close with a special performance by McCready and friends. A live auction will feature a one-of-a-kind Nixon Chris Cornell Sentry timepiece that is touring to Nixon's flagship retail locations in London and Paris in the spring. After taking 2017 off, McCready and Pearl Jam will return to live action this month with a series of South American shows that will see the group play Lollapalooza festivals in Chile, Argentina and Brazil, as well as a headline concert in Rio de Janiero, Brazil; they’ll follow that with a 14-date European run that will open in Amsterdam on June 12. Pearl Jam will launch a series of summer US dates with a pair of shows in their hometown of Seattle, WA this August to benefit homeless initiatives in the city, and follow that with an August 13 appearance at Missoula, MT’s Washington-Grizzly Stadium, as well as two nights at Chicago’s Wrigley Field (Aug 18 & 20) and a pair of Boston’s Fenway Park (Sep 2 & 4).